This VirtualBox appliance contains a fully-configured, ready-to-use SOA Suite 12.2.1.3.0 installation. 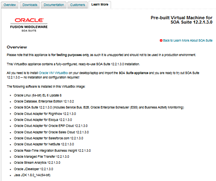 All you need is to install Oracle VM VirtualBox on your desktop/laptop and import the SOA Suite appliance and you are ready to try out SOA Suite 12.2.1.3.0 — no installation and configuration required! Get the virtual box here.